Was wondering if someone would be able to help with a Arduino Sketch for my War machine. I am new at programming and have watched Davids videos but still struggling a bit. 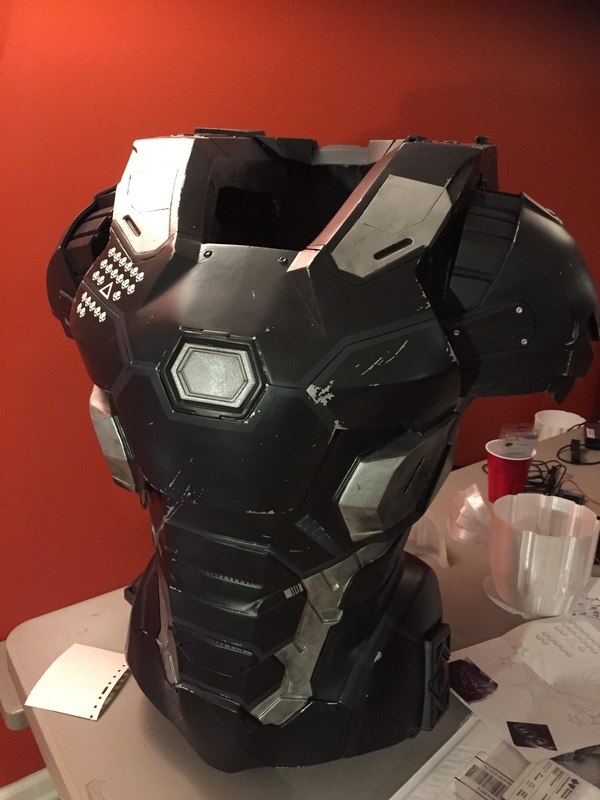 I'm currently building a replica of the War Machine Mark III (Attached photo) and want to be able to have my Leds on the unibeam gradually brighten at start up. I am using Tinycircuts for the board and a neopixel ring to start with. I started a sketch to get the color and flickering effect but not sure how to make it gradually brighten at start up? (Sketch below) Any assistance would be greatly appreciated. How fast do you want the intensity to take to ramp up? Trying to do in about 4 Seconds. I did see that command, but wasn't sure how to incorporate it into the sketch so it doesn't repeat in a loop over and over. Just wanted it to do it once when I press the button and then remain at full brightness. Played with the "strip.setBrightness()" command a bit.. It ramps up in 1 second steps over the first 8 seconds..
My example uses red/blue colors just to make the led activity more noticeable..
Kinda clunky but it works..
Really looking forward to trying this out tonight. At least it gets me started in the right direction, I am a total noob when it comes to programing but I am starting to learn more and more every day thanks to this awesome school and community. I made a small mistake in the code above so use this one instead.